Scottish author David Ashton first wrote an Afternoon Play for BBC radio about James McLevy, who lived from 1796–1875 and was a prominent Edinburgh detective in the mid-19th century. Brian Cox played McLevy in the following radio series which ran for nine series from 1999 to 2012. 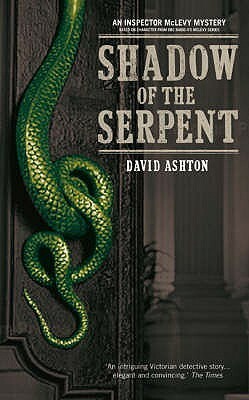 Ashton adapted these into novels of which Shadow of the Serpent was the first to be published in 2006. An online book club buddy recommended them to me following a discussion about detective genre and from only a few pages in I fell in love with the writing, the words and the detail. The Scotsman wrote “The key to the success of the McLevy series, however, is …. the dialogue, which somehow sounds of its time even though it slips easily across the centuries. Because he (Ashton) spends so long getting it right….” It is also speckled with vernacular, just enough to be authentic, not so much as to make it undecipherable and in need of a glossary for those not acquainted with the Scottish tongue. For me, McLevy is a typical Scottish “hard man”, a detective who frequents the “wrong side of the tracks” in the Leith of the 1880s, the pubs, the whore houses or bawdy houses, can stand his own ground in a fight and knows the wynds, closes and backstreets of Leith intimately. But he is also a detective with a deeply ingrained and real passion for justice for all irrespective of who the victim is and of where his investigations take him and whose nose he ruffles. In this novel this takes him into the circles of political power surrounding William Gladstone's Midlothian Campaign of 1879 and 1880 in a lead up to the 1880 election defeat of Benjamin Disraeli as he tries to resolve the brutal murder of one of Leith’s prostitutes. I liked the way Ashton intertwines the political clash of Disraeli and Gladstone into this murder mystery as someone high up is out to stop Gladstone’s election – he shows the different social classes of Edinburgh at that time, the enfranchised and disenfranchised, the well heeled and the hard knuckled, each in their own way striving to better themselves and their lives. Of course we know that the historical figures cannot be the murderer, and we suspect that the woman messenger, Joanna Lightfoot, is a femme fetale, but it is the characterisation of McLevy, his side kick Mulholland, his whore house owning “friend” and supplier of “good coffee” Jean Brash that makes this book and I assume all of these will appear again in the following books in the McLevy series. I liked they way he provides McLevy’s own back story to show how his character has developed from his childhood experiences – the suicide of his mother, and being brought up by a widow woman neighbour.